Indoor Summertime Nature in New Jersey. My New Pet?? If I don’t have anything better to shoot for my “image of the day” I can always find one of the house centipedes to pose. I just wish that they were outside and going after what ever is nibbling on my tomato plants. 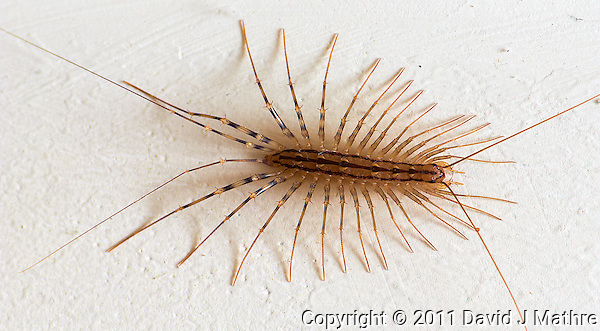 Scutigera coleoptrata (House Centipede) — Not a Silverfish. Image taken with a Nikon D3 and 105 mm f/2.8 VR Macro + TC-E 20 (ISO 200, 210 mm, f/16, 1/60 sec) with SB-900 Flash. Raw image processed with Capture One Pro 6, and Photoshop CS5.